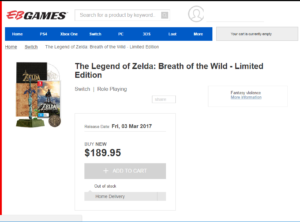 Customer Alert (AU) – EB Games are backtracking on Breath of the Wild Master Edition Orders. 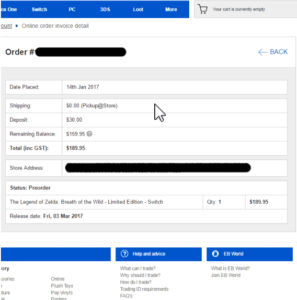 UPDATE: EBGames issued an email at 5:30pm January 16th 2017 advising customers of an error, but only after consumer backlash over social media. It’s truly disappointing, and though technically not illegal according to the ACCC, the right way to have gone about it would have been to offer consumers a generic case and honour the proposed bundles as best as possible… at $189 for a cheap statue that can barely stand straight, a map printed on cheap media, and what seems to be a cut down soundtrack for AU/NZ, without the carry case, this package does not represent good value for anyone, with many people more than willing to sacrifice a throw away statue, instead of a carrying case that will actually prove useful. 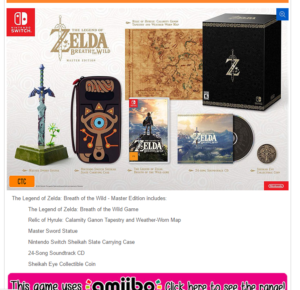 Shortly after Nintendo’s switch presentation, Nintendo announced a collectible Legend of Zelda: Breath of the Wild edition, dubbed the “Master” edition, containing the game, soundtrack, a map, a collectible coin, a Master Sword statue, and a Sheikah Slate carrying case for the Switch, all contained within a classy black box. All order confirmations, clearly marked the name of the edition being ordered as per the original listing. 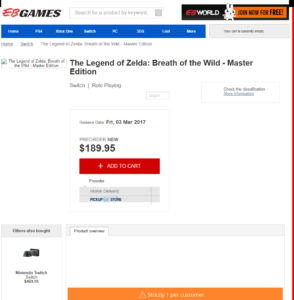 Fast forward one day later, the Master Edition page no longer exists on EB Games website, and has instead been replaced by what is now being referred to as the Limited Edition. With one major exclusion. The Sheikah Slate carrying case for the Switch console, which in my opinion the major offering of this package, and not a cheap sword statue. 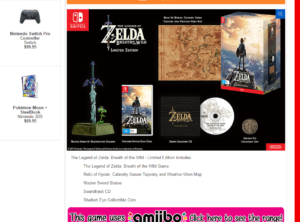 For those that are unaware, Nintendo have stated that they will not be including the carry case for the AU/NZ/European markets, hence why it was removed from the EB Games listing. 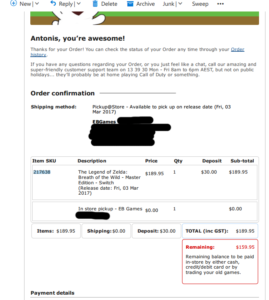 To make matters worse, EB Games have handled this situation EXTREMELY poorly. Rather then send out an email to all affected customers to inform them of the unavailability of the Master Edition, they have simply converted the same SKU, so automatically, all Master Edition pre-orders have been switched over to the limited edition, leaving customers clueless. We’ll be reaching out to EB Games for a comment and will update this post should they respond.